Great top 5 recipes!I can't wait to try them out. How kind of you to host this linky to showcase our recipes. I'm enjoying seeing them all! This time last week I was busily creating a Sonic the Hedgehog cake for my son. Today I'm just blogging about it. Thanks for hosting! Linked up my mango sherbet and looking forward to perusing the other recipes! i love clicking through everyone's treats! this week i've linked up my almond pound cake with blackberry sauce. delish! Lisa, I'd love to share my peanut butter cup crunch brownie recipe, but I'm new to the "linky party" concept. Help, please so I can play, too! :) Thanks! Hi Lisa! Hope you had a good week. I look forward to this link party all day, I'm sharing my chocolate chip oatmeal cookies with you today! Everything looks delicious. Thanks for hosting! And, I'm honored my s'mores made your top 5. Thanks! Finally had more sweets to post! A little late, but I linked up my heart-shaped cookie cake sandwiches- so yummy! Thanks for hosting! I love coming to your party and looking at all the goodies. I brought you my Pear Pie Pocket to enjoy. Thank you for hosting us today and you have a great week end! Hi Lisa! This week I am sharing my recipe for Meyer Lemon Mousse. If you love Lemon Meringue Pie you will love this Mousse! It tastes like a combination of the filling and the meringue. Thanks for hosting- have a great weekend! That ruffle cake is gorgeous! Anyway, I'm looking forward to linking up and following everyone elses pretty creations. I've linked up my Passionfruit Bars. Definitely going to make this part of my weekly routine! So excited to get to make some of these. HI Lisa, thanks so much for your invitation! OOo... just look at all those yummilicious treats here. How could I resist! Thanks again. I'll have my link up after this. HI Lisa, thanks again for hosting! :) I posted my "frogs"! I am now looking forward to your post every Saturday. Your button is posted on my site, and I can't wait to see the posts as they pop up today! I am linked up on your site and looking forward to seeing all the recipes coming today! Thanks for another great link party -- lots of yummy stuff going on here! Linking up my giant cho. chip cookie and peanut butter pie! Sweet, sweet Saturday! 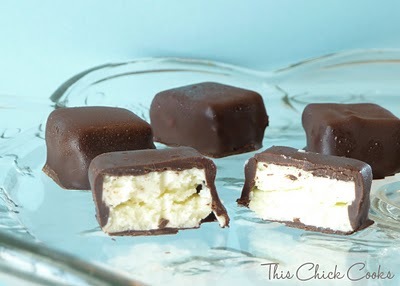 We have enjoyed Chocolate Coeur A La Creme for years, I am sharing that recipe here today. Thanks for hosting! Linked up my amazing chocolate mousse. It is so easy and so good. Love your Linky Parties! Thank you so much! But I am so not in your league of baking or food photography. Even your link friends are amazing! Trust me that ny coffee cake is most decadent! I found some real goodies this week! I've linked up again, thanks! Thanks for hosting Lisa! There are some very tempting sweets already posted. I can't wait to see some more. I just shared my cookie recipe for this week .. They are seriously like candy! 91. White Chocolate Orange Dream Cookies ~ I'm drooling over everyone's deliciousness. Thanks for sharing! It wouldn't load the pictures of the brownies so I went with the dulce de leche cookies. Thanks for this - can't wait to check out everyone else's recipes! Lisa, this is so fun! Thanks for finding my blog. I am excited to post my link and I love seeing all the delectable treats from everyone. Have a splendid Saturday! Thanks so much for inviting me back...once again everything looks divine! I can't wait to try way more than my waistline needs! thanks for the invitation - what a wonderful idea you have with the sweet treats. I will certainly come back here! Thanks for inviting me to the party! I've included my link and can't wait to check out all the other sweets. Thank you for the invite!! I posted my Amaretto Apple Muffins! What a cool idea for connecting with other bakers. Link submitted, and thanks for the invite. Thanks for the invite added my St. Patty's s'mores. The smores from last week look delish! Thanks for the invite Lisa! Everything lookss really yummy on here, can't wait to page through them. My Toffee Coffee cake was very popular on our plates this wk! Thank you for the invite and for your comment on my blog! I just linked up my Guilt-Free Ooey Gooey Chocolate Cupcakes with Marshmallow Frosting - and included a link back on my blog :) Thanks again for hosting - what a fun idea! I posted Easy Toffee-not my recipe though-but I did change it a bit by adding different nuts..Linked to your fabulous blog at the end of my post. There we go; I just linked to my Chewy Chocolate Chip Pumpkin Cookies. Thanks for the warm invite to the party! I linked up with Peanut Butter Swirl Brownies. Thanks for the invite! So many treats! Just linked my Nutella Peanut Butter Cookies. Yum! Thanks for the comment and inviting me to join your linky party, Lisa! Linked up our Pumpkin Cupcakes with Marshmallow Frosting! Thanks. This is WONDERFUL! such amazing recipes!!!! This is WONDERFUL! I linked up my husbands birthday request- Brownie Bottom Cheesecake- - I cant wait to try some more of these fabulous desserts! Thanks for hosting. Lots of temptation here. Thanks for the invite to the party--I linked up my chocolate applesauce cake. Thank you Lisa, for the invitation to add my recipe for Orange Cardamom Streusel Coffee Cake to your Sweet Saturday blog. I also added your link to my post! I have posted my post to your post, and can't wait to try lots of these treats!!! Everything looks so good! I linked up minty oreos, thanks for hosting! Thanks for inviting me to your fun party and for hosting! I liked the rosemary cake roll post! have a wonderful weekend! I am off to make lemon meringue cupcakes. Hi Lisa! Thanks for the invitation! Our Banana Chocolate Chip Muffins are made a little healthier with white whole wheat flour and olive oil! They still turn out light and delicious with chocolate in every bite! Thanks for inviting me to link up. WHat wonderful looking treats! I linked my oreo truffles! I can't wait to make some of these goodies! I've linked my Crepe Cake. Thanks for the invite! Hi Lisa! What a great idea! I've linked my oatmeal cookies. Your blog is great! Hi Lisa! I've linked up my apple streusel muffins...they may not be all that to look at but to taste? Oh my! Hope your exams went well this week. This is so cool! I linked up my vegan banana nut waffles. Thanks for the invite and for hosting this! Everything looks delicious. I think I will be selecting one of these desserts to make over the weekend! Yum! Hey Lisa, I've linked my coconut banana macaroons. Thank you so much for the invitation and for visiting my blog! There are some great looking things here! Hi Lisa! Thank you for inviting me to link up! I linked up my bananas foster blondies! Hi Lisa, thanks for the invite. Everyone's goodies look so yummy. Thanks for Stopping by Lisa, What a lovely collection of Deserts you got here !! I have bookmarked this. thanks for inviting and glad to be participating. Thanks for the invite Lisa. Have linked up my Red Bean Buns for this party. Happy hosting! Hi Lisa, I've just linked up a cold dessert! Thanks for hosting! I've linked up my Gluten-free Vanilla & Cinnamon Apple Cake - a sweet treat for those who cannot eat wheat. This is a fun party, so many treats...too many temptations!!! Thanks for your note and reminder!! I'm going to try to remember your collection as I post during the week! hi Lisa, I've linked my lemon curd (cup)cakes! 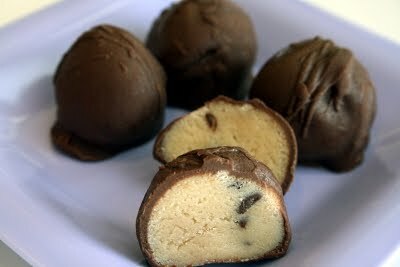 I have big plans to make those cookie dough truffles—YUM! I added my chocolate chip goodness link! i linked up my chocolate chip cookie dough truffles, but you do already have them on your post, hahah, oh well, the more the merrier, YUM!! Thanks, I added my Lemon Curd link to your party! And now I'm following so I won't miss out on all these treats! oh! so many new things to try! awesome! Thanks for your kind words about my White Chocolate Blondies. Hi Lisa! Glad you stopped by! 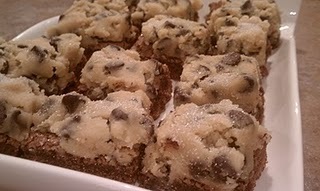 I linked up my chocolate chip cookie bars! Thanks for stopping by and asking me to link up! This is such a fun idea! Hi Lisa, thanks so much for the invitation to post my link! All the other pictures and blogs look so delicious, I can't wait to check them out! Thanks for the invite. I linked up. Lots of yummy recipes on here. What a fun party! I've linked to the pumpkin waffles I made recently. Can't wait to check out some of the other delicious treats! Wow.....what a huge assortment of goodies to drool over..... thanks again Lisa..... what fun! What a great sweet treats here, I love all of them. Thanks for the invite Lisa! everyone's treats look so good! I hope I'll get the time to try out some of them. Thanks so much for the invitation to join Sweets for Saturday :) I brought my Fruit Filled Dutch Baby and can't wait to try some of the other bloggers' amazing looking recipes! Hi Lisa, thanks for reminding me...hope to see u next week too.....wonderful sweet treats. Great idea! Thanks for inviting me :) I posted my red velvet cupcakes and brigadeiros, which are my Brazilian husband's favorite sweet. Thanks for including me, Lisa. What a great idea, and I found some things I want to make among your list of posters! Whew, linked up just in time. Sorry Lisa just saw your comment. Wish I had gotten this link up before it closed. i think i missed the deadline, but here are my mini red velvet cupcakes for one! Thanks for the comment on my blog today. I just love browsing through all of these sweets every week. My favorite is the Cookie Dough Truffles. I want to try that so badly. You have no idea.